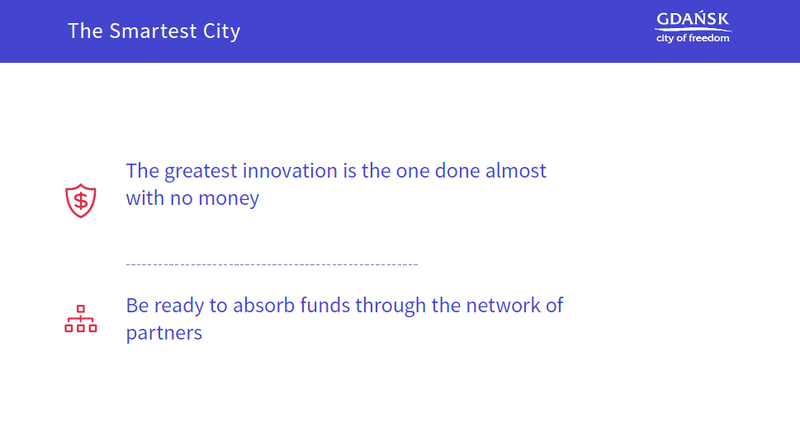 A few weeks ago I made a presentation on how in the city of Gdansk we are trying to develop a good model that stimulates and supports innovation and what in my opinion is the uniqueness of this peculiar ecosystem. The model is not based on any financial program or grant, but on a broad platform of cooperation. Since my presentation is based on graphics and slogans, accompanied by a spoken comment, and since it proved to be quite popular, I decided to add in words which are not in pictures. We are limited by rigid and over-regulated legal system which does not reflect the dynamics of social and technological change. Unfortunately, we have not adopted the Scandinavian custom of periodic review of the functioning laws, so as to verify their real impact on reality. Lawmakers also do not fully understand the world today, but that’s a topic for another article. From the point of view of the public administration official, I must also indicate the applicable copyright law resulting in a shutdown of multiple systems as a significant barrier to growth, which I will mention in a moment. But the biggest and most important obstacle lies within ourselves. In our mentality, in our psychologically justifiable barricading in the status quo. Reluctance to change, to experiment and to take risks of failure are very important factors, which every innovator must take into account. The relevant part of the resources must be assigned to create a culture of innovation inside the city, institution and organization. Indicated in social diagnoses are: the inability to cooperate, especially long-term, lack of well-understood common objectives and lack of ability to share experiences and advice. These factors are perhaps just as important as the lack of financial resources. Social capital is even more difficult to build than the material one. I’ll put perhaps a risky proposition: I think the time has come when the best promotion of the city are its people, its culture, a lifestyle of citizens. Part of what makes cities seem attractive is not so much a good advertising campaign, as a well-presented to the outside world, style of co-created by administration and residents “genius loci” of the city. This is what makes people today willing to share information about a town or city, throw its pictures on Instagram, like it in social media. It is this difficult-to-grasp perception of the city where openness and innovation in business, education, and culture begins to play a dominant role. Thus, a city that wants to be considered “cool”, worth a visit or even moving to, chooses this path also due to the fact that it becomes more attractive. The city’s real advertising campaign is the quality of life it brings, or even more: can one fall in love with it? Gdańsk is a part of Tri-City, or even seven-city urban metropolitan area. Administrative boundaries are barely visible to visitors, and in practice we live, work, spend leisure time freely moving between several municipalities. The same is true with our start-up and tech area. Some of us live in Gdańsk, but have their company in Gdynia, while others study in Sopot or Gdańsk, while living in Gdynia. 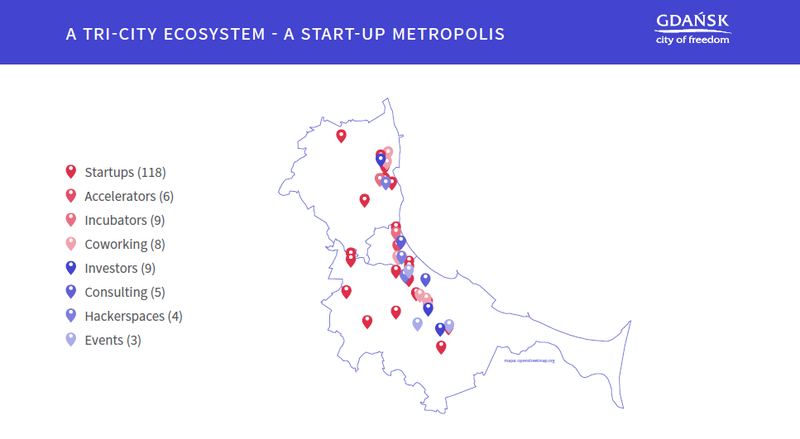 A map created by grassroots start-up community shows it well: incubators, co-working facilities, start-ups, accelerators, representatives of venture capital and various events are scattered all over and beyond the Tri-City. They complement each other, sometimes compete with each other, but always enrich the whole agglomeration. This is, what I think, distinguishes this system from other cities that I know. It is the prevalence of cooperation and mutual goodwill over the competition. In any case, competition is non-destructive, but stimulates the development of the offer. The market of innovative companies and projects grows bigger, so there is space for everyone. Of key importance are institutions established to promote entrepreneurship in different ways. From my point of view, even more important is the attitude of people managing them and their willingness to cooperate. Thus in Gdańsk you won’t hear the opinion that the EU parks are throwing money down the drain. 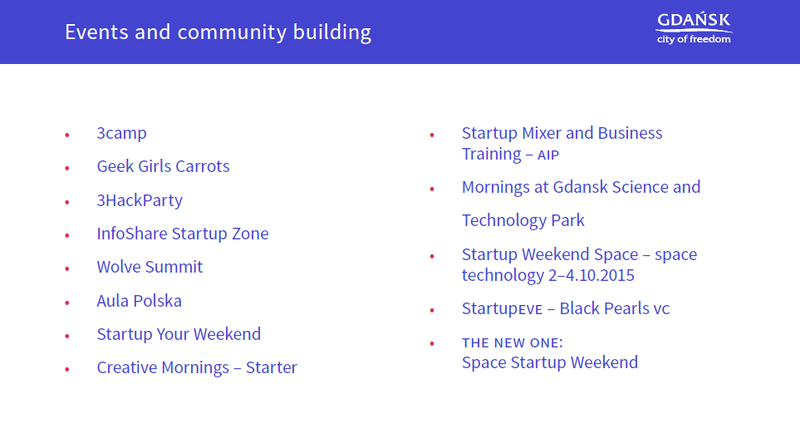 And so the start-up zone in the Pomeranian Science and Technology Park has considerable achievements of incubated projects and hosts many interesting events, highly specialized and targeted to a wider audience. In Gdansk Science and Technology Park, which is administered by the Economic Zone, there is a place for young companies and area for laboratories. Here the implementation of scientific achievements and their commercialization takes place. The park is also a home for Polish space sector. Many events geared towards the start-up people and people associated with the tech-business are hosted here. A nationwide network of Academic Enterprise Incubators also complements the range of possibilities. The key institution for Gdansk local government is Incubator Starter for Gdańsk Foundation for Entrepreneurship. Co-working, space for meetings, office space, Crazy Room, a lot of accelerative activities, training and many, many others. Please refer to the website, where you can keep track of subsequent events and initiatives. A start-up Gdańsk has stood so firmly on its feet, that some private initiatives also appeared in this space. O4, founded by a private entrepreneur Maciej Grabski, is located in the office complex Olivia Business Centre. Its creation alone means the next higher stage of the business environment, where the market becomes mature enough for business to take over financing from the public sector. A completely new and unique to our part of Europe offer is CLIPSTER venture that combines the resources and experience of public and private entrepreneurs. In short, Clipster offer is addressed to technological nomads who want to get a place to live and work, as well as mentoring support. For approximately 230EUR per month the entrepreneur whose idea has a chance of a global career, has a flat and the space to develop his/her business. Currently the first recruitment round for this project is completing. Large conferences and competitions are sort of holidays. Most of them are supported by the local government, become a fiesta for the community, an opportunity to summarize, award some winners, invite visitors from the outside. It’s also our best promotional media. The fact that the administration should skillfully and where possible support innovation and industry startups (startups tend to be different. They are not always Internet ventures) of various stripes sounds like a cliché today. But why is it only successful in very few places? The key is the right combination of people in the right place. It seems to me that such an initiative has no chance of development without the authorities understanding. They indicate directions and set priorities. I will say briefly that several cities in Poland, including Gdańsk are lucky to have such visionaries at the helm. However, in order for the priorities to be implemented we need people who work on them every day. That is why it is so important to designate the duly authorized representatives in local government. Such representatives would also contribute greatly to the central administration. In Gdańsk we are lucky to have a group of people in office who are open-minded and willing to help and experiment. It is difficult for me to judge my own merits in the role of Chief Technology Officer (the official nomenclature is the Deputy Mayor of Gdansk for the Innovation), but the newly appointed Chief Data Officer works for us for sure. Without the support of many people in the office who go beyond their duties and offer the steady advice and logistical assistance nobody would do anything alone. No fear in cooperation with business, NGO sector, and academic community is also a big benefit of the crew with whom I am lucky to work. A couple of the pillars of our formula of office are shown in the graphic below. All these activities and programs have the great advantage of changing the way we work and rebuilding the mentality of a large group of people. I have already mentioned barriers which are created by copyright restrictions. 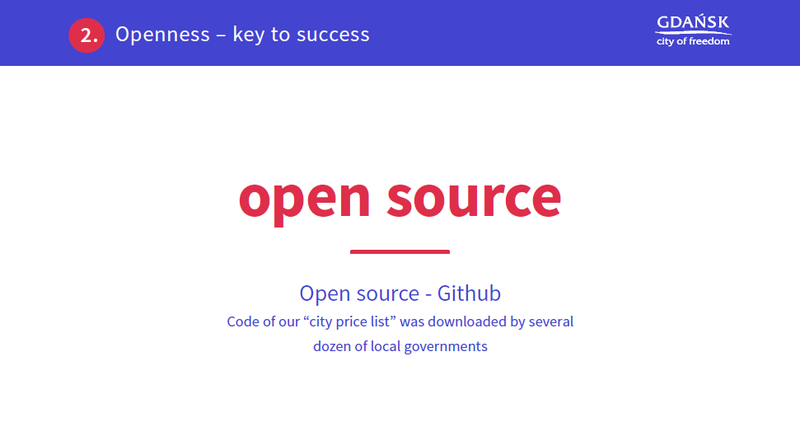 Therefore, in the framework of the adopted a year and a half ago the policy of openness in Gdansk, we are trying to popularize and advocate for the greatest possible openness of the software used in the City Hall. 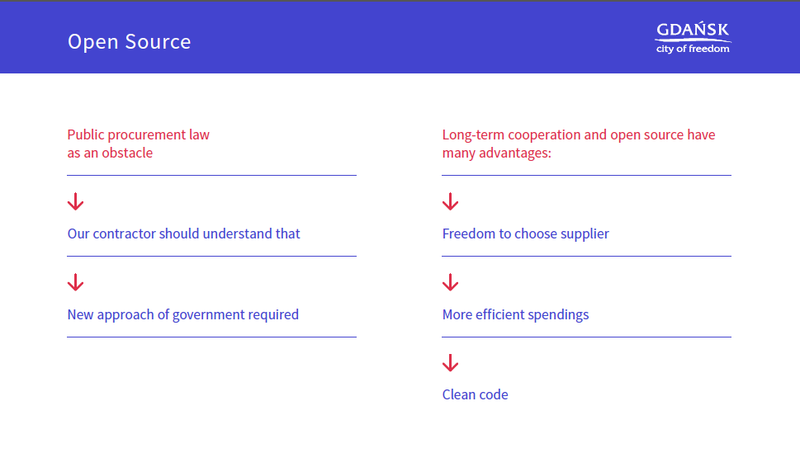 We follow some general principles amounting to the conviction that public money, once spent, should serve the largest possible number of citizens. We also assume that our service providers and software developers need to compete for price and quality of services, and not checkmate us with their license fees. Hence, the idea of an Open Source as part of the philosophy of the reconstruction of urban infrastructure. Gdańsk, the City of Liberty wants to have the freedom to choose the provider that best serves its residents. The Open Gdansk project provides our stakeholders mainly with raw data for further use by residents, coders, businesses. 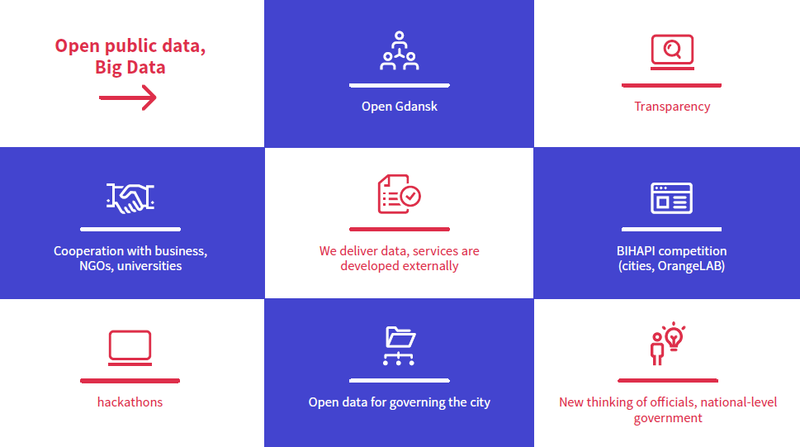 However, we put a lot of effort into ensuring that open data applications are created to solve issues important to the residents of Gdansk. The cooperation with the Foundation eState (Fundacja ePaństwo) and the Code for Poland project helped us develop important projects for little or no money. Examples? www.Wyrzuc.to (ThrowIt.Away) application helps understand how recycling system is organized in Gdansk and www.bandgdansk.com allows pinpointing on a map the best locations for planting trees in the city. These open source application can be downloaded from github.com. Sometimes, simple solutions are the best ones. 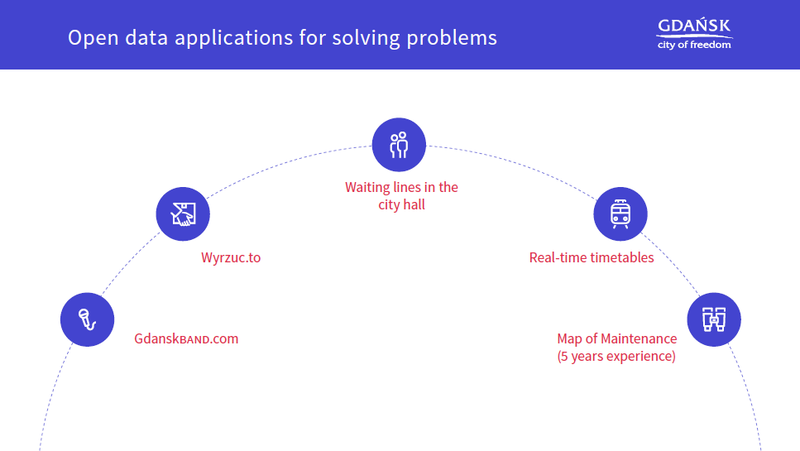 Real-time data on the waiting time in the city hall (available at gdansk.pl/numerek) saves you time. You need a new driving license or a birth certificate for your newborn? In the first place, check on the Internet how many people before you are in the waiting line. 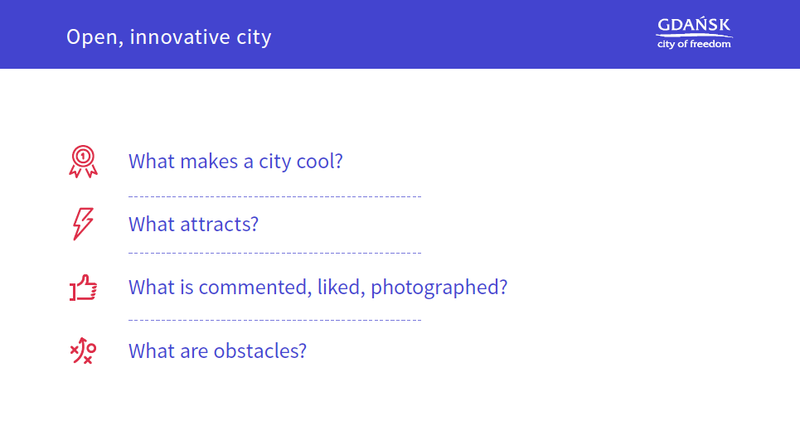 What else is important in fostering innovation in the city? We think a crucial factor is a leader who strongly believes in the importance of IT solutions for better cooperation with city residents. Of course, developing advanced ICT solutions can cost a lot, but there are ways to overcome this difficulty. 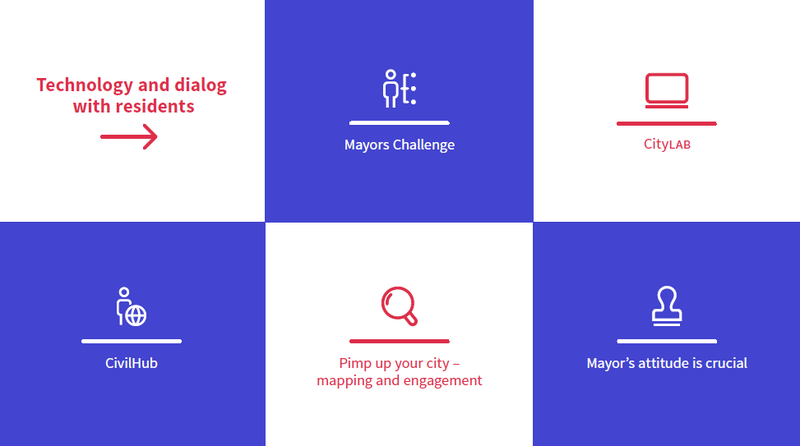 One of them is to take part in a competition like Bloomberg’s Mayors Challenge. Another idea is to look for a NGO sharing with us the same values. We did this with the CivilHub.org portal, an open source solution for facilitating contacts between officials and residents. We know that city innovation needs time, know-how and right people. 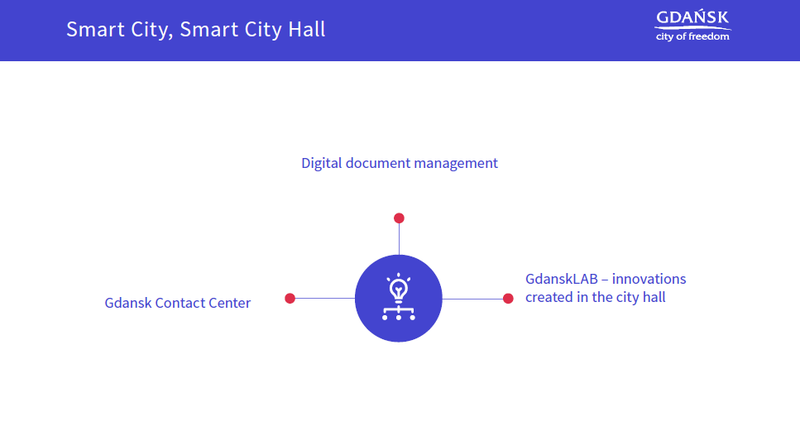 An internal team of innovators, called GdanskLAB, was set up to improve our workflow and break down so-called silos in the city hall. It would be hard to run such a project in a city lacking aware, active leader, but our mayor and his deputies fully support GdanskLAB. Effects exceeded our expectations. Crucial initiative is GdanskLAB, a team of city hall’s officials who work together on innovative ideas. People are our great asset and we are aware that salaries in the public sector in Poland aren’t very competitive. What can we do with it, is increasing job satisfaction and creating innovation also in HR. 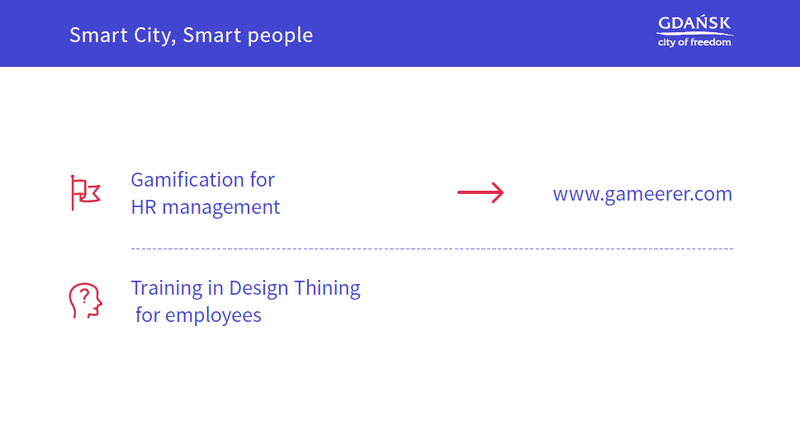 That’s why we decided to run Gamereer application (Gamereer is for gamification + career), an innovative way to add gamification to HR process. Employees of the city hall also take place in Design Thinking training. 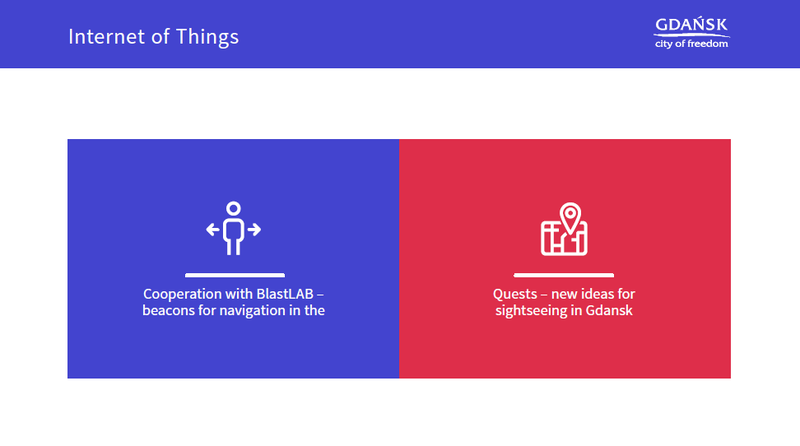 Open approach towards new ideas of entrepreneurs and residents is another feature of Gdansk. You’ve got a new idea for changing the city for better? Just call us, meet with us and if only the idea is feasible, we will help create a prototype. ‘Blind’ management, by intuition only, is no logner the case in Gdansk — we rely on objective, reliable data. 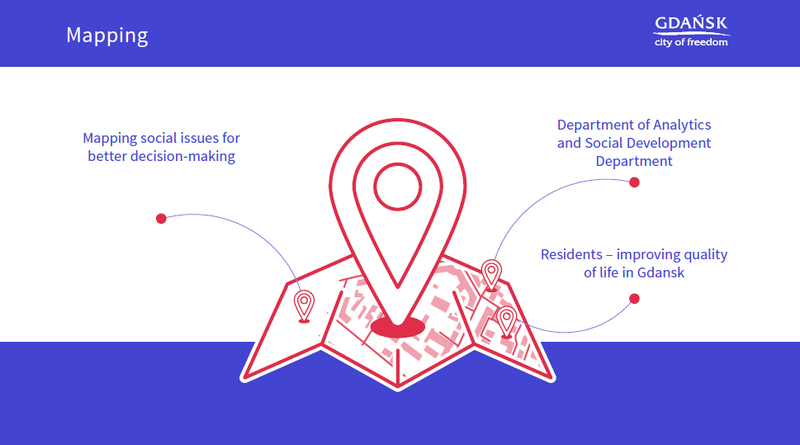 Heavy use of data bases and mapping social issues make great change in solving city’s issues. New projects will be evaluated and presented to a wider public. Distinguishing in our smart city approach is assumption that innovation is possible with little money, sometimes — even with lack of money. The greatest innovation is the one done without money. Working on prototypes, testing them with partners from non-public sector give us perfect experience to apply for funds from external sources (like the EU), as soon as they become available. 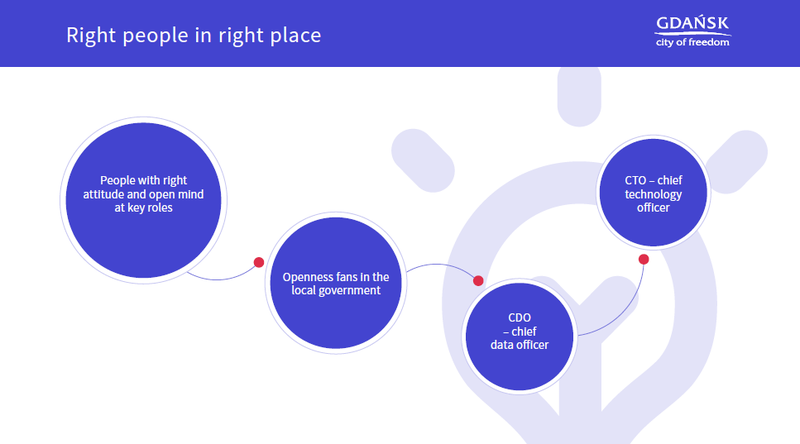 OPENNESS is the foundation of smart city in Gdansk. For sure we don’t want to be a city like Bejing, where technology is heavily used for governing the city but issues related to civil society are ignored. 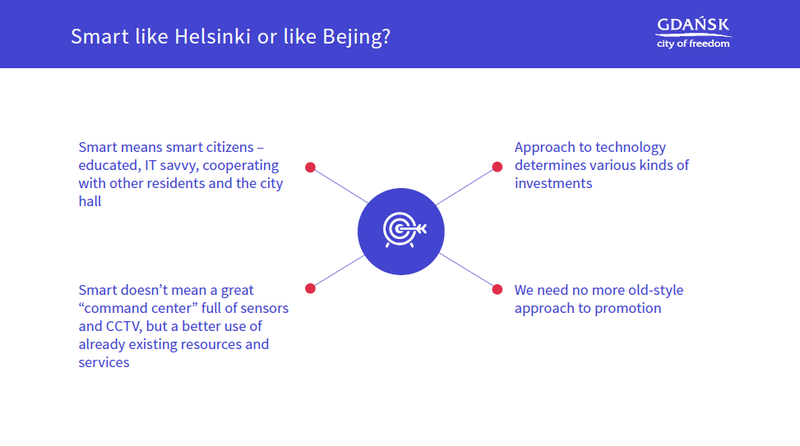 We would like to be more like Helsinki, where a resident is a focal point for decision-making in the city. According to this approach, needs of various stakeholders are taken into account on every level of developing innovative solutions. Estonia is a European benchmark for us. The country has population no greater than the Tricity (Gdansk-Gdynia-Sopot), but achieved a great success in digital development of government, education, culture, business. The city of Gdansk — official Medium channel. Innovation, start-ups, smart city.